Minister of Transportation, Chibuike Rotimi Amaechi has assured that the Federal government under President Buhari will ensure the sustenance of the Abuja-Kaduna rail project upon completion. Briefing news men after a brief inspection and test ride of the rail project on Wednesday in Abuja, Amaechi said the project will be completed and should be ready for use in July. “Is it sustainable? The answer is yes because it’s on its own. If you say whether it will be subsidized, it will be. We are working out the details of how much it will cost to carry passengers and to maintain it,"he said. “We are looking at bringing Mr. President to commission in July. In two weeks time, they will do the test run of the track without passengers, after that two weeks, it will take another two weeks to do test run with passengers and it will be free of charge and that will take us to the end of June. This means by first week in July, we believe that the President will come and flag it off for commercial service. “At the beginning we had done the test run but then it wasn’t completed. Today it has been completed. So today is the first test run that we are doing on the completed standard gauge. The signaling, communication, stations are all completed now so you can actually technically say today is the first day of test running the completed project," he said. Amaechi also said, his ministry would partner with the Nigeria Identity Management Authourity to ensure smooth registration of passengers without hitches. 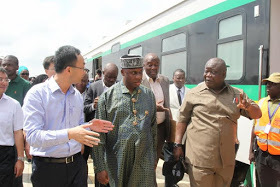 PIC: Minister of Transportation, Chibuike Rotimi Amaechi (middle), with the Managing Director, China Civil Engineering Construction Corporation Ltd. (CCECC) Jack Li (left) and the Acting Managing Director of the Nigerian Railway Corporation, Mr. Fidel Okhiria (right) during the test run of the newly built Rail line from Abuja (Idu) to Kaduna, Wednesday.